Ownership / Access: Houses the South Tyrolean Museum of History. 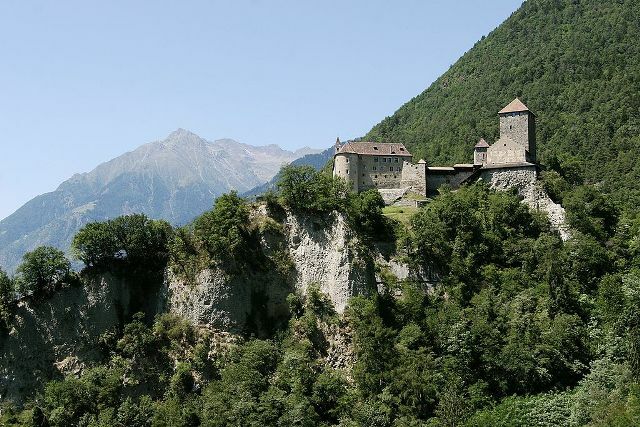 Notes: Tyrol Castle, less commonly Tirol Castle (Italian: Castel Tirolo, German: Schloss Tirol) is a castle in the comune (municipality) of Tirol near Merano, in the Burggrafenamt district of South Tyrol, Italy. It was the ancestral seat of the Counts of Tyrol and gave the whole Tyrol region its name.The castle hill has been inhabited since ancient times. Several artefacts and one field of graves from the early Middle Ages have been identified. Archeologists have excavated a church with three apses dating from the early Christian period. The first castle was built before 1100. The second construction phase including the keep dates to 1139/40. A third phase of construction took place in the second half of the 13th century under Count Meinhard II of Gorizia-Tyrol. In 1347 Meinhard's granddaughter Countess Margaret of Tyrol was besieged here by the forces of the Luxembourg king Charles IV. The castle remained the seat of Tyrol's sovereigns until 1420, when the Habsburg archduke Frederick IV moved the administrative seat to Innsbruck north of the Brenner Pass. In modern times parts of the castle fell into the so-called "Köstengraben", a steep gorge. It was even sold in order to be used as a quarry. In the 19th century the castle was restored; the keep was rebuilt in 1904. Regarding art history, the frescos of the castle's chapel are of special interest as well as two Romanesque portals with opulent marble sculptures showing legendary creatures, religious themes, and geometric ornaments. Today, Tyrol Castle houses the South Tyrolean Museum of History. Next to the castle there is a falconry with a nursing ward for birds of prey.